An orrery – a mechanical simulation of part of our solar system. An orrery is a mechanical device that is used to show the motions of bodies in the solar system in relation to our Sun. Modern orreries are typically clockwork and display planets on wires which will circle the Sun – sometimes these can also be called planetariums, but planetariums tend to show projected representations of the movements of celestial bodies. It is thought that the first orrery was created as far back as the first century BC by the Greek philosopher Posidonius. This model will likely have represented the Sun, the Moon and the five known planets at the time it was made. 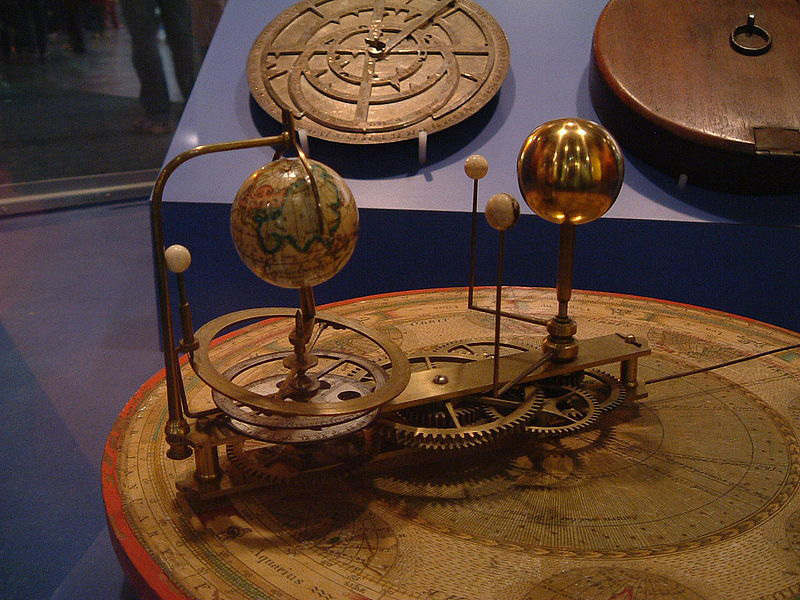 The first modern orrery was created in 1704 by George Graham and Thomas Tompion. Let’s find out some more interesting facts about orreries. Orreries can be a variety of sizes. Some are hand held devices whereas some have been known to be room sized. An orrery should include the Sun, Moon, Earth and other optional planets. If only the Earth and the Sun are represented the model should be called a tellurion. If only the Earth and the Moon are shown on the device then it is called a lunarium. Orreries are not usually built to a scale. The Antikythera mechanism is considered to be the first example of an orrery and likely very similar if not identical to the orerry thought to be created by Posidonius. The Antikythera mechanism is an ancient mechanical calculator that was used to calculate astronomical positions and was found in a shipwreck off the coast of Antikythera. It is dated at around 150-100 BC and strangely, other technical instruments of a similar complex creation were not created for another 1,000 years. The design for the first modern orrery created by George Graham and Thomas Tompion was given to the famous instrument maker John Rowley of London for him to make a copy for Prince Eugene of Savoy. He later also made a device for Charles Boyle, 4th Earl of Orrery which is how the device was given the name “orrery”.